No, really. You owe my kids an apology, Colleen Hoover. They were in their play room playing “princesses attack Shopkins” -those Shopkins should have seen it coming, Cinderella has unresolved abandonment issues and it was bound to come out at some point. Just saying. I digress. So there they were playing nicely amongst themselves (minimal screaming), and I thought “Oh hey, let me just take these few minutes to start my new book.” Two hours of parental neglect, three episodes of Peppa Pig, and one completed hostile Disney princess take-over later I came out of my book-fog. I forced myself to resume parenting by reminding myself there were only a few more hours until I could put them to sleep for the night and get back to the book. It was HARD. I briefly contemplated how they might fare making themselves dinner, but neither of them are over the age of 5, so the book stayed closed. 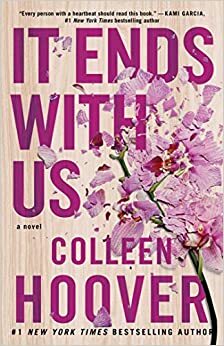 In all honesty, I already love Colleen Hoover as an author, so I knew this one was going to be good. But I was absolutely not prepared for the wave of emotions I’d feel reading it. I went from sympathy, to excitement, to sadness, to amusement, to anger, to hopefulness, back to anger, and finished off with relief-laced disappointment co-occurring with a confusing sense of contentment. I literally closed the book and stared at my husband (who was trying to gauge my reaction and failing) before answering his “So, how was it?” with, “I….I’m not….it was good…I think?” I was still mid-process, I didn’t know how to feel. My feels had feels. I don’t think this book is good, I know this book is good. It’s great. It’s thought provoking, and it’s important. It tackles the very complex and tragic issue of domestic violence, but it does it in a way that opens up your point of view to not just anger for the abuser, and not just sympathy for the victim, but a raw and honest glimpse into the absolute struggle that can rage inside both parties. I almost don’t want to even give a breakdown of the plot of this story because the importance of what happens and the twists that unfold are a huge part of what makes this book what it is. Okay no, not ‘almost don’t want to’, I’m not going to. That’s how strongly I feel. If you’re looking for a light, surface-level romance read, this one might not be for you. Although the romance in it is also fantastic (#teamatlas- you’ll get it when you read it). The relationships that develop are incredibly believable and realistic, which is not always how things go in romance novels…but it is if they’re done right. However, if you’re looking for a story that is compelling, and for characters that you end up feeling so invested in that you want to be friends with them in real life (the main character, Lilly, writes to Ellen DeGeneres in her journals, how awesome of a character detail is that) then give this one a try. Bravo, Colleen. I was a fan before, but I’m your fangirl now. I’m going to write to YOU in my journals.